Liquid crystal displays appear on wrist watches, laptop computers, and hundreds of other commercial devices. Here is the only book that explains all of the electrooptical effects which can be invoked to produce an LCD. Written from a physical, rather than a chemical viewpoint, there is much here to help in the design and implementation of displays. This latest edition includes all the recent advances in physical understanding and applications. Structure of liquid crystal phases; mixtures; liquid crystalline materials; direct influence of an electric field on the structure of liquid crystals. Dielectric permittivity; electrical conductivity; optical anisotropy and dichroism; viscoelastic properties. Structure of surface layers; surface energy; cells and orientation. 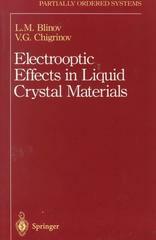 Electrically controlled birefringence; twist-effect; supertwist effects; "guest-host" effect; the flexoelectric effect; reflectivity in an electric field; field behavior of the isotropic phase; electric field effects in nematic polymers; electrooptical properties of polymer dispersed liquid crystal films. Orientational modulated structures; electrohydrodynamic modulated structures; nematics in spatially nonuniform fields. The pitch of helix and the optical properties of cholesterics; field-induced dielectric instabilities of cholesterics; electrohydrodynamic instabilities in cholesterics; flexoelectric effects; electrooptical effects in blue phases; electric field behavior of nonferroelectric smectics. The physical properties of ferroelectric liquid crystals; methods of measurement; electrooptical effects in ferroelectric liquid crystals; ferroelectric liquid crystal polymers. Displays; optical data-processing devices; other applications.